ColciGel® is a prescription transdermal gel that provides relief of acute gout flares utilizing patented Isopeutic® Transdermal Technology, US Patent #5,6545337. The Gensco® patented transdermal drug delivery system used in ColciGel® carries a proprietary formulation, through the skin to the locally affected tissues. 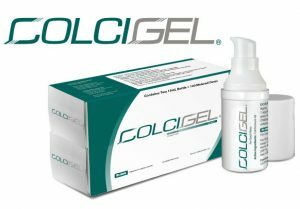 ColciGel® is applied directly to the affected site of the gout flare and results have been observed in 3-48 hours. ColciGel® is proven to have negligible systemic absorption minimizing side effects, interactions and comorbidities caused by oral colchicine and NSAIDs. 2012 American College of Rheumatology Guidelines for the Management of Gout. Part 1. 2012 American College of Rheumatology Guidelines for the Management of Gout. Part 2. The Gout & Uric Acid Education Society is a nonprofit organization of health care professionals dedicated to raising awareness about gout arthritis, with the aim of improving the quality of care and minimizing the burden of gout. The Gout & Uric Acid Education Society offers complimentary resources for both the public and medical professionals. The Gout and Uric Acid Education Society (GUAES) does not endorse or recommend any Gensco Pharma, LLC products. Gensco Pharma and GUAES have not entered into any overarching partnership. The First Transdermal Treatment for Acute Gout Flares. ColciGel® is the first prescription transdermal gel indicated for treatment of acute gout flares in adults. Metered Dose Technology (MDose™) dispenses the exact amount of medication. Clinical results demonstrate that ColciGel® is not significantly absorbed when applied topically, therefore, there is limited potential for drug accumulation. ColciGel® is easy to apply directly on the site of pain over a 2” x 2” surface area. Each pump is a measured dose for simple adherence. 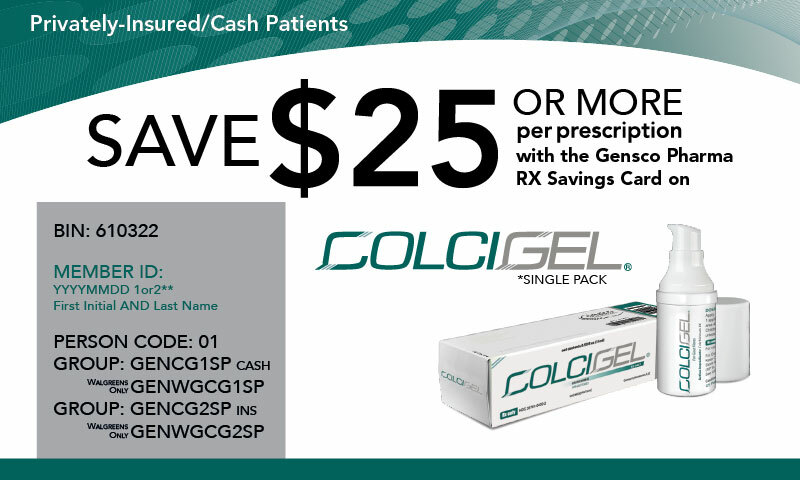 ColciGel®, is distributed through Specialty Pharmacies including Walgreens®, Cardinal, Cigna Tel-Drug, Optum BriovaRx and Senderra. ColciGel® is contracted with DAPA (Contract #SP0200-15-H-0003), Federal Supply Schedule (FSS), making it accessible to all military personnel and is also available to all MEDICARE patients (Medicare Contract #P1466). 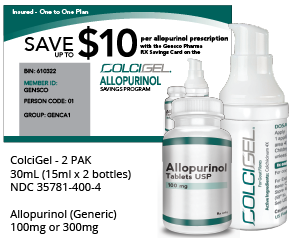 If you also have a prescription for Allopurinol, the ColciGel-Allopurinol Savings Program can help you save up to $10 on your Allopurinol prescription. 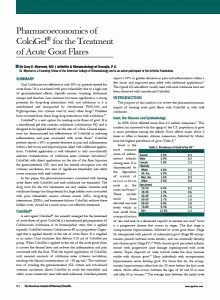 Affordable access to ColciGel® for acute gout flares and Allopurinol for the management of uric acid levels. These offers not valid for prescriptions reimbursed under Medicare, Medicaid, or any other federal or state program, or where prohibited by law. Where third party reimbursement covers a portion of your prescriptions, this coupon is valid only for a portion of the amount of your actual out-of-pocket expenses. Offer valid only for prescriptions filled in the United States. Affordable Medication Solutions reserves the right to discontinue this offer at any time. 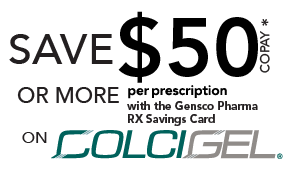 This offer cannot be combined with any other rebate or coupon, free trial, or similar offer for the specified prescription. The discount will be accepted only at participating pharmacies. This is not a form of insurance.